Homemade soft pretzels are easy to bake. Here's how. 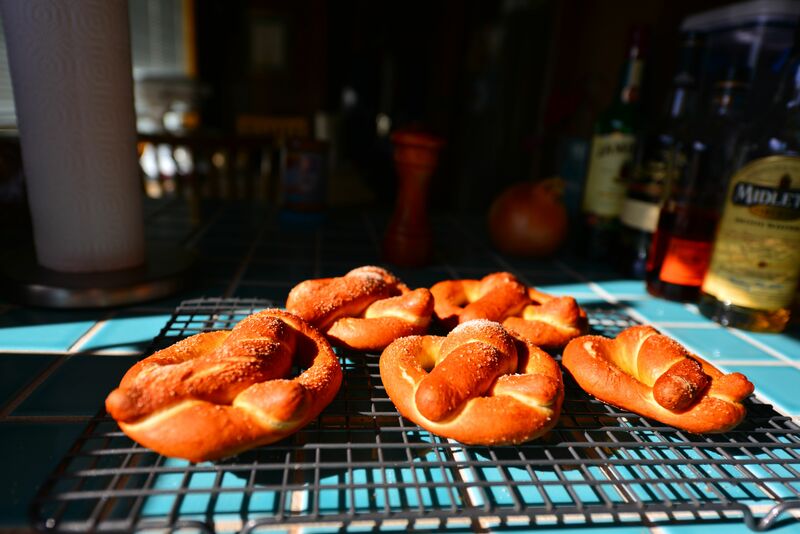 My daughter and I just baked a batch of our favorite, Bavarian-style, soft pretzels. Making them is so quick and easy. Writing this post takes longer than making a batch. Pre-heat your oven to 400ºF. Mix yeast and brown sugar in the ¾ cup of warm water and let proof for 10 minutes. Put flour and salt in large mixing bowl. Add liquid. Knead until the ball of dough has picked up all the loose flour and is smooth. Start a 3-5 quart pot of water boiling. Add 2-3 tablespoons of baking soda. Let boil. Roll out pretzels. I suggest taking golf ball sized balls of dough and rolling them in your hand until the string of dough is about the diameter of a grease pencil or sharpie. Then twist into pretzels. Line a baking sheet with parchment paper, or your favorite non-stick method. Boil pretzels in the baking soda water mixture for 10-15 seconds each. My rule is to let them sink to the bottom and then retrieve a few seconds after they float to the surface. Place the pretzels on the baking sheet. Immediately before placing in the oven, sprinkle with salt to your preference. Bake for 18-19 minutes. I suggest serving with mustard, Hannah thinks putting something so disgusting on a pretzel is craziness. Makes 6. Feel free to double the recipe.